Sadly, today is the anniversary of the death of Trayvon Martin, and the parents of Trayvon Martin will hold a hoodie vigil to commemorate the tragic anniversary of their son’s death. One year later, the Stand Your Ground law remains in Florida, and it will likely be in force for the foreseeable future. The Zimmerman trial is set for June, 2013. Oddly enough, the Zimmerman legal defense is no longer using the Stand Your Ground law in his defense. Zimmerman’s lawyers know that they cannot defend their client under that law. The Trayvon Martin murder is just another sad reminder that black life in America is not valued. Yes, I think he was racially profiled by George Zimmerman and murdered. 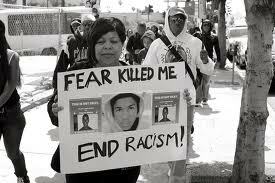 I am convinced, as well, that if Trayvon Martin were a white male killed under similar circumstances, the Sanford, Florida Police Department would have handled the murder suspect very differently. The Zimmerman case is riddled with the racial dysfunction that plagues this country. What also must be addressed as part of this country’s racial dysfunction is black on black murder. Everyday, murders occur in the Hood. No, the media does not cover it because it is not considered newsworthy. After all, it’s just black people killing each other, right? All these murders, whether mass or one-on-one are all the more reason for gun control. Stand Your Ground is law in Florida thanks to the scurrilous influence of the gun lobby and other wealthy advocates. This law only promotes vigilantism which puts all Floridians at a greater risk of gun violence. Those most threatened by this kind of law are black men, and black people in general. After all, the Second Amendment was written in part to appease southern militia whose sole purpose was to control the black slaves. Rest in peace, Trayvon Martin and condolences to the family once again. This entry was posted in Race and tagged Gun Control, Hoodie Vigil, Racial Attitudes, Second Amendment, Southern Militia, Trayvon Martin on February 26, 2013 by speakingthosethings.